What do George W. Bush, Ronald Reagan and Harry Truman have in common aside from being past presidents? 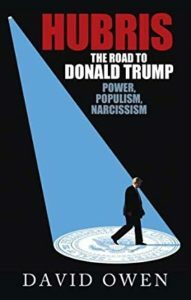 All developed a psychological condition called the hubris syndrome while in office, says Lord David Owen, a peer in the U.K.’s House of Lords and a physician-author of several remarkable books, including In Sickness and In Power, The Hubris Syndrome and most recently, Hubris: The Road to Donald Trump, Power, Populism, Narcissism. What Is The Hubris Syndrome? In The Hubris Syndrome, Owen describes a condition characterized by grandiosity and an exaggerated sense of self-importance. It shares features with the psychiatric diagnosis of narcissistic personality disorder (NPD), but these conditions are not identical. Those leaders with the hubris syndrome are talented and have a sturdy sense of self-confidence. If they have many of the defining features of NPD, they aren’t disabled by these personality traits. Nevertheless, these men and women are in risky territory once chosen for high office. They can become, Owen contends, intoxicated with power and can develop an attitude of omnipotence. Hubris or Narcissistic Personality Disorder? The key difference between those with the hubris syndrome and NPD, is that those with the syndrome gradually usually settle down once they are no longer in office. They can then regain good judgment and a balanced perspective. Those with NPD, however, are more likely to remain self-aggrandizing to such a degree that it can impair their functioning. · excessive confidence in their own judgment and contempt for the advice or criticism of others; “hubristic incompetence”—e.g., they aren’t interested in the details of a policy, sometimes resulting in unfortunate results. Historical leaders who, in Owen’s view, showed patterns of behavior descriptive of the hubris syndrome include George W. Bush, Tony Blair, and Margaret Thatcher. I had the opportunity to meet Lord Owen a few years ago on one of his regular trips to Houston. (Watch my 2014 Menninger Clinic interview with him on our blog.) He told me that he thought George W. Bush developed the syndrome during the period of the Iraq war, but that since leaving office his capacity to listen and consider the opinions of others seems to have been restored. Owen cautioned, however, that occasionally extreme hubris in a leader does not resolve when the term of high office ends. Somewhat sardonically, he told me that he thought Tony Blair would want to be “King of the World” if there were such an office. So, what can we say about our world leaders today? One critical component guiding any leader’s behavior is his or her personality style, with all of its strengths and vulnerabilities. The New Personality Self-Portrait provides a system to consider your own unique combination of personality styles or traits. No single style defines anyone. But if the results of your NPSP25 test show that some of the styles in your profile are extremely prominent, you might want to learn more about risks. For example, what is your potential for problems at work or in relationships should these styles become extreme? As for Donald Trump, I look forward to discussing him with Lord Owen the next time we meet.